There are many different ways to create a pneumatics system. This is the description of just one approach that works, with suggestions for others. Feel free to mail corrections/suggestions/questions. That's one helluva pressure, so make sure all your connectors and tanks are designed for it! CO2 fire extinguisher. This is the only type of gas storage tank now allowed in Robot Wars UK. Proofed to 200bar, so it's nice and safe. Convenient valve and connector, although you're better off with a screw-in type valve, as show here. See the Robot Wars Technical Datatsheet on Pneumatics. We use liquefied CO2 at about 50 bar/750psi - CO2 liquifies at about 750 psi at room temperature. When you vent the tank, the pressure drops and some of the liquid boils off to produce more CO2 gas. Absorbs a lot of heat in the process. Alternative is Nitrogen or High Pressure Air (HPA). Need a larger tank for Nitrogen or HPA as it is not liquid, but do not have the CO2 problems of freezing and danger of liquid getting through the regulator into the cylinder and blowing the seals (as experienced by Nemesis). Nitrogen and HPA and more popular at BattleBots, where you are allowed to use up to 2500 psi. 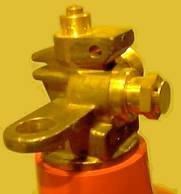 Close up of valve as supplied. On the right is a screw-in plug that contains a burstable diaphragm rated at 190bar, to prevent the tank from bursting if over-pressured, so DO NOT REMOVE! 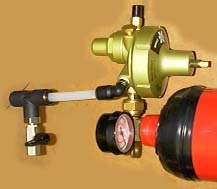 Two-stage Nitrogen regulator from BOC. Nitrogen bottle connector is different from CO2, so I machined up a short brass tube to rigidly connect it to the tank. Alternative would be to have a short length of hydraulic hose. 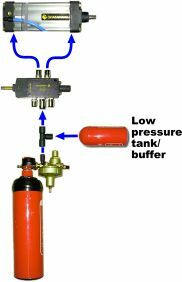 The regulator is used to drop the pressure from the 69bar in the tank to the 10bar used by the cylinder. 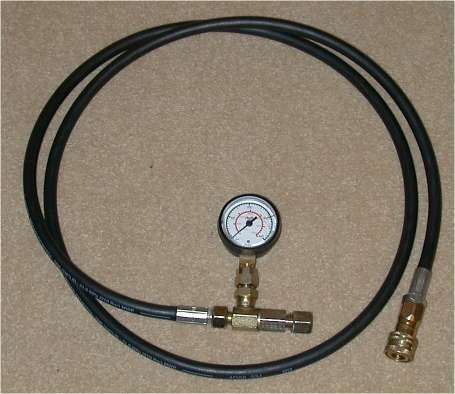 Normally the regulator has two pressure gauges attached, one to measure the source pressure (69bar) and the other for the outlet, regulated, pressure (10bar). The high-pressure one was moved to the decanting hose and the low-pressure tank has a guage built into the base, so I just used blanking plugs to seal the holes. Assembled tank and regulator. Also shown is a manual vent ball valve, used to de-pressurise the system after a fight. This would be left open at all times outside the arena, to ensure that no pressure can be in the system. CO2 regulator as used in pubs for soft drinks? NONE - use full pressure custom/hydraulic cylinders. TRICKY! Approach taken by Cassius, Chaos 2, Big Brother. Plastic pneumatic tubing is available in sizes from 4mm to 14mm OD. We used 14mm. Blue piping on left is fexible polyurethane. White nylon tubing is less flexible, but has a thinner wall, hence a larger bore, 10mm vs 8mm, so has higher gas flow rate. Note that this piping is only for low-pressure (150psi/10bar, after the regulator). You have to use something like hydraulic hose for the full 1000psi/69bar. 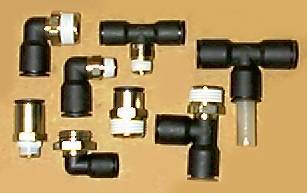 Fittings (available in sizes to match tubing) are just a push fit onto tubing. Threads are also available in a range of sizes. To get a decent flow rate use at least G3/8", preferably G1/2". Piping, fittings and valves are available from any decent Pneumatic Equipment supplier. 5 port = five connectors - one for supply, two to cylinder and two exhaust. Seen here are the supply (central) and two exhausts. Designed to operate a double acting cylinder. Pilot = air assisted. 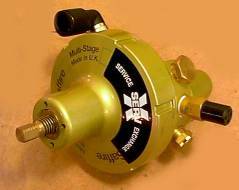 The solenoid just opens a small valve that causes a bleed from the main supply to open the main valve. 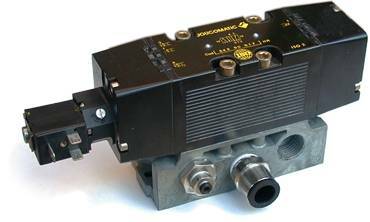 This means the main valve can be much larger (higher flow rate) and the solenoid smaller, than in a solenoid-only valve. Coil (on left) is available in a range of voltages - 12/24/240V. This needs to be controlled by the Radio-Control Receiver somehow. One method is to use one of the popular Team Delta R/C switches. Available in the UK from DMachine's E-Shop. Notice the restrictor on the retract exhaust, to limit the retract speed. Just a 4mm adapter. Diagram showing the flow of gas through a five port valve in its two states. Old 5 port valve we used. The valve area was too small, limiting the speed of the cylinder. Dry powder fire extinguisher. Proofed to 20bar. This acts as a 'buffer' for the cylinder. 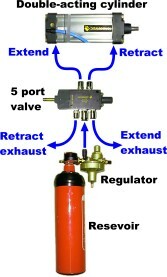 The regulator could not supply a high enough flow rate to move the cylinder quickly. The regulator just fills this tank to 10 bar and when the valve opens, this tank fills the cylinder nice and quick. You may need back generator to support your High pressure storage tank, you can find some cheap deals at http://northeastgeotech.com If you not going to find any good deals on Honda generators you can find other qulity brands here http://sweethomeguide.net/best-portable-generator/. All the generators are ranked based customer's votes. The business end! Most pneumatic cylinders/rams are rated at 10bar/150psi, though some are 200psi. Available in a huge range of shapes and sizes. Double acting - one port for extending (seen here connected to blue pipe) and the other (top end, underneath) for retracting. Has adjustable end stops (brass screw next to port) to slow the piston as it nears either end of the cylinder. Removed the seal from the extended end to ensure no loss of speed on firing stroke. Used the retract one to slow the piston and axe at the end of the retract stroke. To calculate the force generated by a cylinder, simply multiply the pressure (10bar/150psi) by the area of the cylinder piston. This cylinder has a 100mm bore, so the force generated is > 800kg, though you can lose up to 25% of the force due to friction. Make your own, as Rex did for Cassius, from the front fork of a motor bike. Use a hydraulic cylinder, as Chaos originally did (Phantom nose wheel actuator). You'll need one of these connected to the front port of the cylinder. As the pressure starts dropping at the start of the extent/fire stroke, the exhaust valve opens and quickly exhausts the gas from the cylinder, so that it does not have to make its way back through the solenoid valve, so increasing the cylinder speed. I tried this one done by RS (Pneumatic SMC Adjustable Quick Exhaust Valve - 209-9248), but was unimpressed. Seems to be more of an adjustable speed limiter. Farnell do a couple of more promising looking ones - 706-6715 (Norgren) and 707-7257 (Festo). To fill the tank, you'll need some way of connecting to a large supply bottle. This system needs to be carefully manufactured and tested to withstand the pressures involved. Hydraulic hose is a popular choice. You would need a vent valve (not shown here) built onto the hose, to allow you to vent the gas in the hose before disconnecting. CO2 is easier here as it is only 50bar/750psi in the bottle, so no danger of over-pressuring tank. 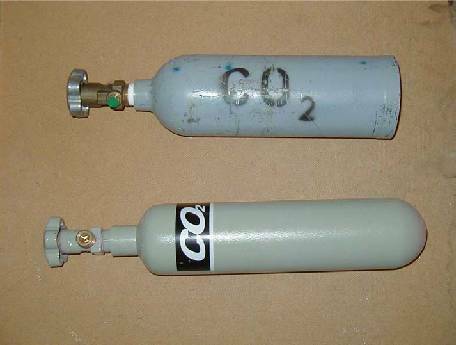 You can get CO2 bottles as either gas draw or liquid draw - we would want liquid draw. Nitrogen, however, is supplied at 230bar/3300psi, so you would need some system to limit the pressure admited to the tank. Suppliers of gas: BOC or Air Products. Got some hydraulic hoses made up (by MF Hydraulics in Oxford) so that we could mount the regulator remotely from the main tank. 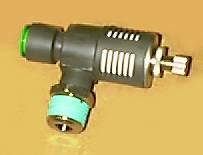 Quick release connector is at right-hand end of hose. Adds a bit of weight, though. Hose is 6mm i.d. and can take 210bar. Outer sheath is pinpricked to avoid ballooning if any air seeps out.